You know..I got jealous when I heard it’s snowing somewhere else. I guess I just have to be happy that at least it is cooler now here in the Lonestar state. 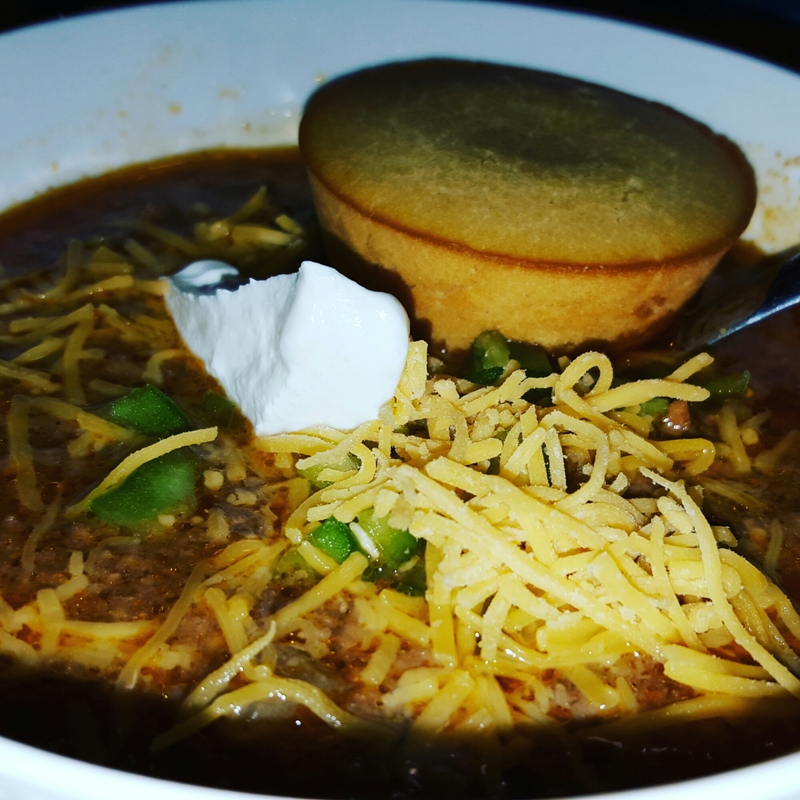 I have been wanting to make chili but without the beans of course. My husband does not like beans at all. While watching Limitless on Netflix this afternoon I started preparing my chili ingredients. Chopping my onion, garlic and seranno pepper, then rewinding my movie and then sautéing then in the instant pot, then rewinding my movie again. After sautéing my onion , garlic, chopped seranno pepper and ground beef in the instant pot, I added the homemade chili spices, chopped tomatoes and tomato sauce and start my Instant Pot with the chili function for 30 minutes defaulted but I reduced to 25 minutes . I will type the recipes tonight after the Walking Dead hehehee. I remember there’s garlic powder, onion powder, paprika, cayenne pepper, red pepper flakes, pepper and peppers, cumin, brown sugar, cocoa powder, salt and pepper. 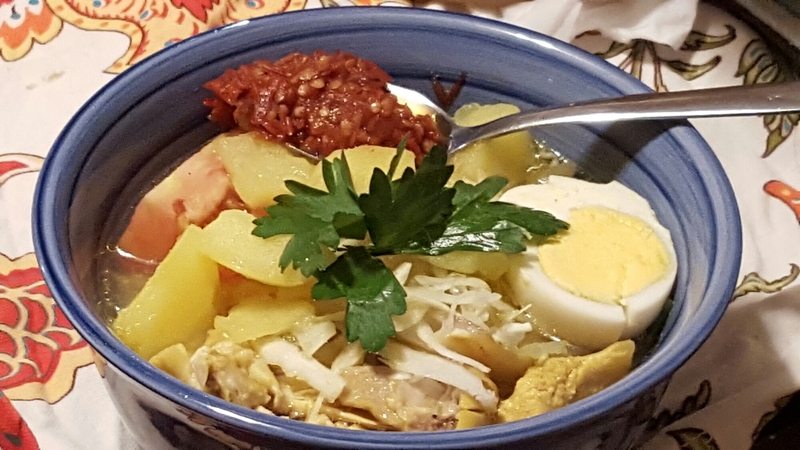 And for dinner and to send meal for the meal train, I decided to make Soto Ayam, Indonesian chicken soup. I blend the spices in my magic bullet and then sautee them in a little oil in instant pot with the Sautee function . Add in the bone in chicken breast, 2 stalk of lemongrass, galangal, kafir lime leaves, water up to the 10 cups line. Closed and press manual 25 minutes. After it beeped, quick release the pressure and take the chicken out to shred. Add the cut up golden potatoes, closed and press manual 5 minutes. 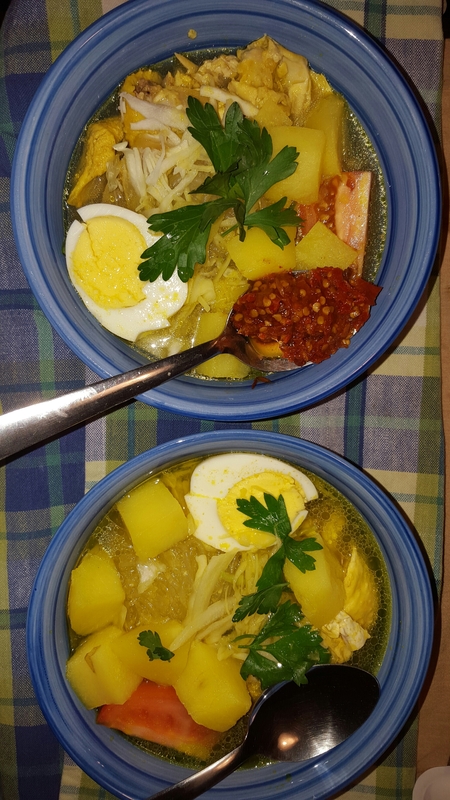 While in the other instant pot, I cook my hard boiled egg for 5 minutes then NPR 5 minutes. And then use that pot to cook my rice 6 cups with almost 7 cups water and closed the lid, press manual 3 minutes and NPR 7 minutes. Last one, boil water and soaked the glass noodle in it to softened the noodle. 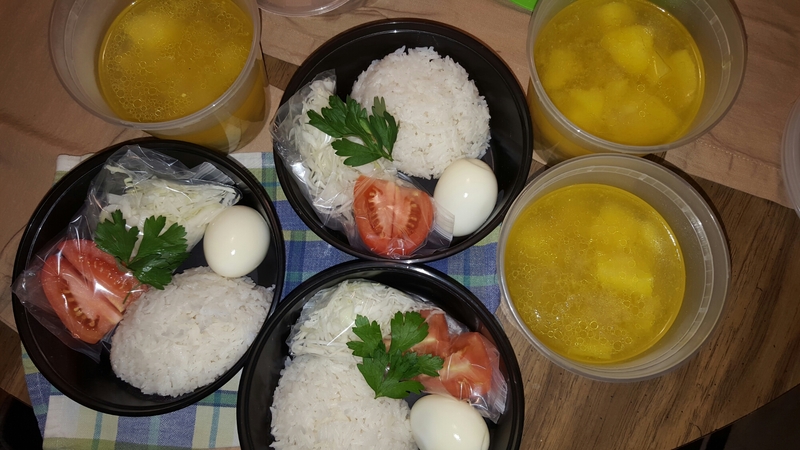 I serve the Soto in a bowl…arrange the rice, glass noodle , shredded chicken, shredded cabbage, sliced tomato, hard boiled egg and pour the broth over it with the potatoes Garnish with parsley and a wedge of lime to be squeezed into the soup. You can add more salt and pepper to your taste once it was done cooking. 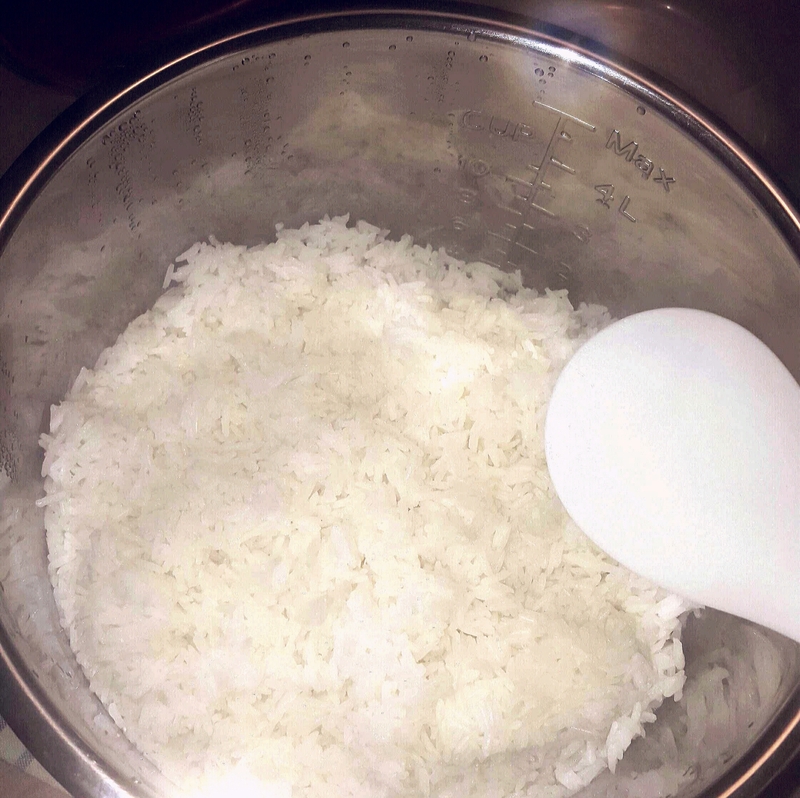 My rice cooker was broke and since then I make my rice in the instant pot. The proportion is 2 cups rice with 2 1/2 cups water or chicken broth. Works fine for my Asian taste. Oh my lord Neegan you are making me nervous. Wonder what is he gonna do now. That guy scares me. sandwiched in between the pumpkin cake and covered with cream cheese frosting . Yes it was deliciously loaded with calories but so worth to eat it. Once a year at least. There was my day with Instant Pot. And ended my Sunday with Walking Dead and my cheesecake. Just perfect! Hope you all have a nice weekend and easy Monday ahead.